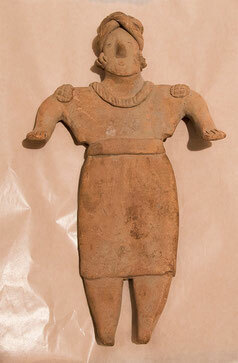 This is an example of the style of figurine not only found at sites in Colima but in Jalisco and Nayarit as well. In most cases the long skirt could identify this character as being a woman or perhaps even a priest. However, the indentations seen on either far side of the belt could be recognized as the popular highly stylized representation for breasts, used by many artists at the time. Figurines like this one are usually found in the shaft tombs prevalent in West Mexico, suggesting they have some sort of funerary purpose. These shaft tombs usually date between anywhere from the Early Formative to the Early Classic. Members of families were deposited and added to these tombs over generations. The two types of figures found in these tombs vary. The flat and less expressive ones like this one are usually found with the earlier members of the generation and over time the contemporary style for hollowed out portraiture like representations, sometimes doubling as vessels, emerged. Given the details and characteristics that are found with the more contemporary figures, it is thought by ethnologist Peter Furst that they may have links to shamanistic practices of the Huichol Indian ancestors. Others yet, think that these tombs might have also belonged to rulers. At any rate, West Mexican figurines are some of the most appealing in Mesoamerican history. The lack of evidence for these cultures’ use of the commonly used calendrical system or little to no influence of the political developments made by larger groups such at the Maya or Aztec, make them somewhat of an enigma within the study however. To add more to their mystery, the style of spouts for these later vessels, is similar to that used in the Andes by the Peruvians. Perhaps time will reveal more clues and one day we will know the detailed history of artifacts such as this one.